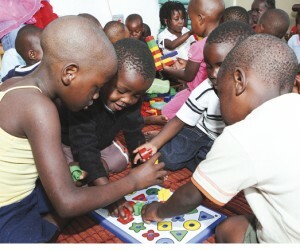 Following the recent hype in the media around the importance of early childhood development (ECD), and amidst strong criticism that South Africa is suddenly investing heavily in tertiary education and skills development, officials now have to seriously question the relevance of pouring huge amounts of money into skills development. This is especially the case since a very large number of these individuals seriously lack the basic fundamentals associated with early learning. Internationally, educationists agree that a child’s ability to learn is shaped during the first six years of life. Millions of children across South Africa have returned to school in 2016, joined by a whole new intake of young people who started school for the first time. The sad fact is, says South African experts, that many of these first-graders have already been short-changed as real learning starts even earlier—with well-planned early childhood education. Achiever tracked down experts Ian Corbishley (Operations Director: The Unlimited Child), Karina Strydom (Co-Founder and Program Developer: BrainBoosters) and Hendrik Marais (Co-Founder: BrainBoosters) to get to the bottom of the story. Sharing his opinion on how compulsory ECD, as part of the school curriculum, will improve education in South Africa in general, he says the hype around matric results in South Africa is a major factor in denying our seven million pre-school children their constitutional right to quality early learning. “The media, along with politicians and education bureaucrats, focus exclusively on the National Senior certificate results—but international research proves this is too late and mostly in vain. Each age cohort going through 12 years of schooling loses one million drop-outs before the Grade 12 year. Research by Nobel Prize winning economist Prof JJ Heckman has revealed that the greatest return on education investment is when the investment is predominantly in the first seven years of life. On the same topic, Karina Strydom says it all depends: if the lack of stimulation at home is addressed in an efficient manner, the results at school can be tremendous. “Many children who are now sitting in class without engaging with the curriculum will start learning. Learners with an early success experience with literacy and numeracy will be more enthusiastic to continue with it. If, however, the ECD curriculum again assumes prior knowledge of concepts and uses applied knowledge to introduce basics, it will probably not make a major difference. However, she says this does not mean it should be done instead of mother tongue education, but parallel to it. Transition to English as the language of learning in Gr 4 or 5 will then be smooth and natural because the concepts, skills and vocabulary will be entrenched. But, he says although it is Government’s responsibility to drive processes, the solution is for the public and private sectors to work jointly in partnership. Referring to the introduction of Grade R classes into state schools, Corbishley, who joined The Unlimited to set up a bursary scheme after retiring in 2006, says it has had limited, if any, success, due to lack of training, lack of resources and insufficient suitably qualified teachers. Looking at how Government can go about easing this terrible disadvantage, and its role in addressing this problem, Corbishley says Government is between the devil and the deep blue sea. Covering the same topic, Marais says there is no single silver bullet. He feels that with political will and full commitment from the government—a huge chunk of money can be drawn from education budget to improve Grade R and the rest can improve schools. She stressed that no quick fix will work. Encourage the media, such as radio and TV, to discuss the why, who, when and how of early childhood stimulation. Learn from the methods and success of the HIV/Aids program. According to Corbishley, the implications for our economy, should we not manage to introduce free ECD programmes to the millions of children whose parents cannot afford to pay for ECD, will be huge, as we have school graduates with poor quality matric passes entering the world of work. Some of our school leavers are unemployable. Unemployment and crime will persist in to the future. Finally, looking at the role corporate companies can play when it comes to filling the early childhood development gap in order to positively impact South Africa’s future, Corbishley says corporates can make a significant difference by recognising the need to re-direct some of their CSR investment into early learning strategies and interventions. Presently the focus of investment seems to be on secondary and tertiary education. There needs to be a balance. Families can make a difference by stimulating their own children through appropriate communication and love. Parents must speak to and play with their children from birth. Individuals can volunteer to assist those organisations that are truly making a difference, either through service of financial help. Marais agrees and says BrainBoosters for instance has launched a parenting intervention programme in 2011 to corporate SA, but companies were not interested in getting their hands dirty.